I had to make this dish for a class I am taking. It had been a while since I had made risotto. It is just as good as I remembered it. The first thing out of my husbands/s mouth was “Mmmm”, and then, “This is really good”. I completely concur. Because of all the veggies it is colorful, flavorful and so delicious. This is a dish does take a lot of stirring, which is necessary to get the creamy texture. After you take one bite you will know it is worth the effort. In a medium saucepan add the broth and water and bring to a boil. Par cook, until just tender, the carrots and green beans in the cooking liquid. When the carrots and greens beans are just tender transfer them to an ice bath. Drain and set aside. Reduce the heat of the cooking liquid to a simmer. Add olive oil to a large dutch oven over medium heat. Sauté onions until they are translucent and softened. Add rice and stir onions and rice so that the rice is coated with the olive oil. Sauté the rice until the ends of the rice grains are translucent. Add garlic to onion and rice mixture. Sauté until garlic is fragrant. Add wine into rice mixture and stir. Stirring is important to the process of releasing the starches in the rice. Sauté until the wine has been absorbed by the rice. When the rice has absorbed the rice add a ladle of the cooking liquid and stir frequently. Add more cooking liquid by the ladle full, only when the rice has absorbed the liquid. 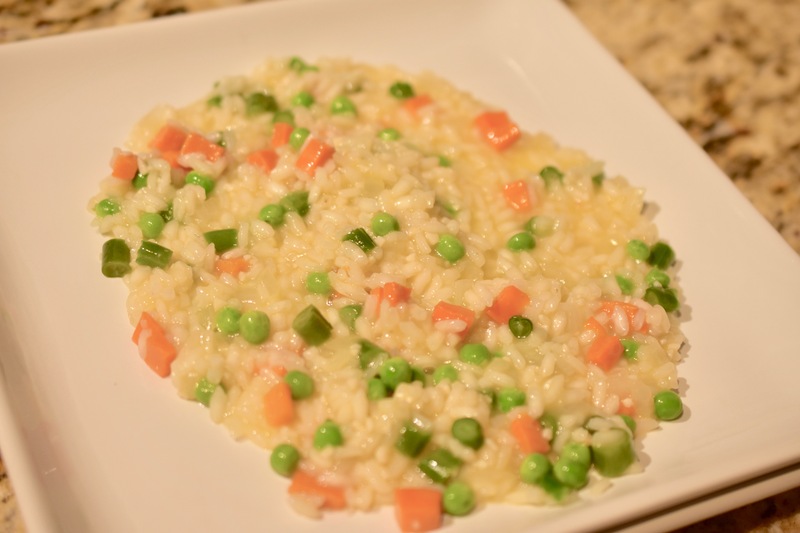 Repeat this process until the rice is tender and the starches have been released to make a creamy risotto. Add the carrots, green beans and peas. Stir and cover with a lid for to let the risotto rest for 1-2 minutes. Note: I garnished ours with Violife Parmesan. It was amazing.